I love to decorate for each holiday. 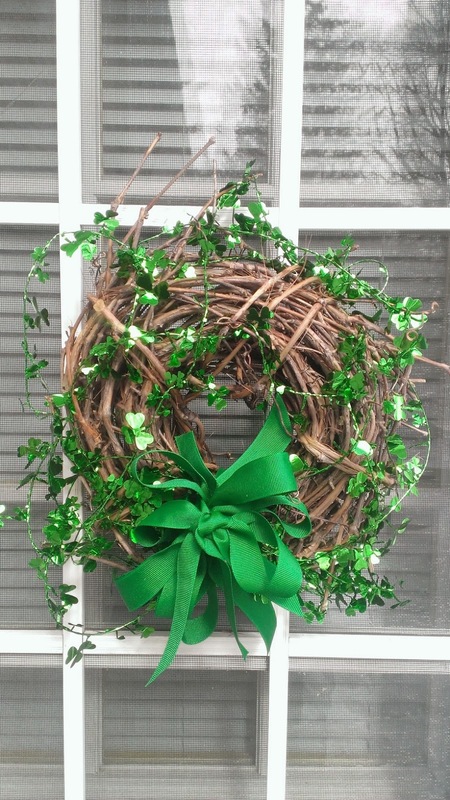 I always decorate the vine wreaths I have on my front and back door. Each holiday I add a little holiday touch to them. I like using shiny items because the sun shines off of them and they show very pretty from the road. 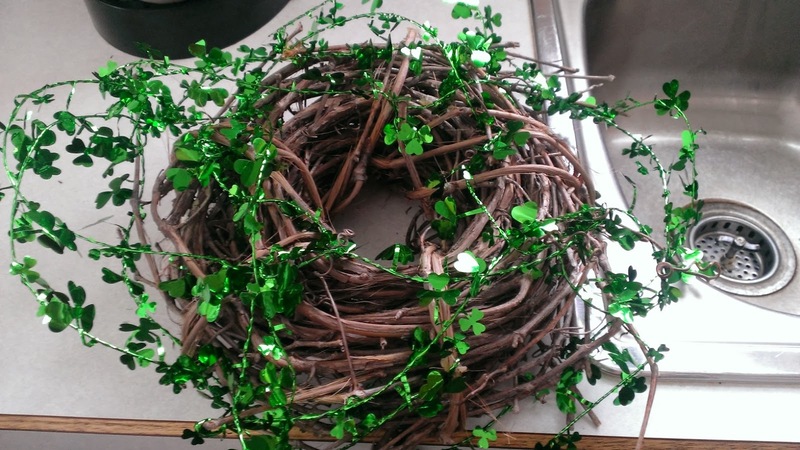 About 15 years ago I made my own vine wreaths - very easy to make. I redecorate them for all holidays. 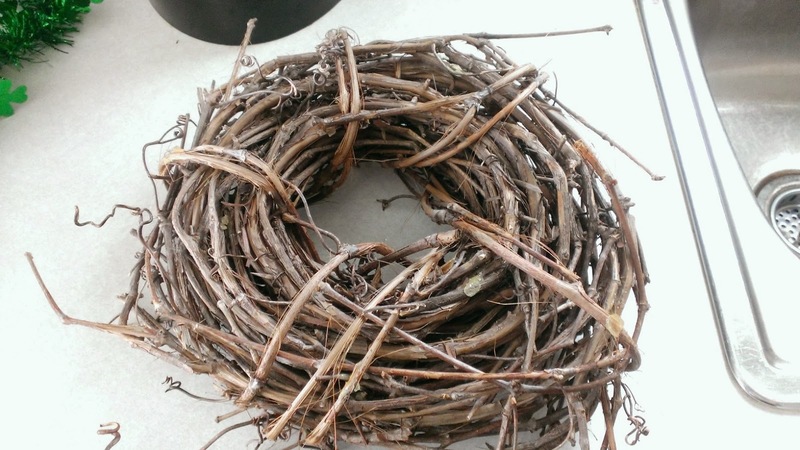 You can often find used vine wreaths at rummage sales or thrift shops. If you want you can also purchase new from the store. Hobby Lobby, Michaels, JoAnns and even Walmart has vine wreaths. I have a small wreath for the back door and a large wreath for the front. To make the wreath I need 1 roll of ribbon and a shiny designed rope. 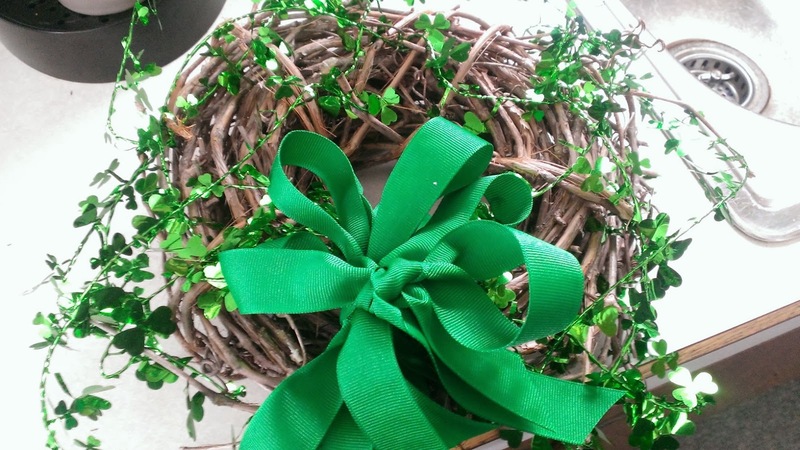 For the back I used foiled rope with shamrocks and for the front door Isa picked out green garland. Ribbon, rope and garland was purchased from the Dollar Store. Wrap the rope around the front of the wreath. Do not go in and out and around. Stay on the front of the vine - using the vine to hold the rope in place. 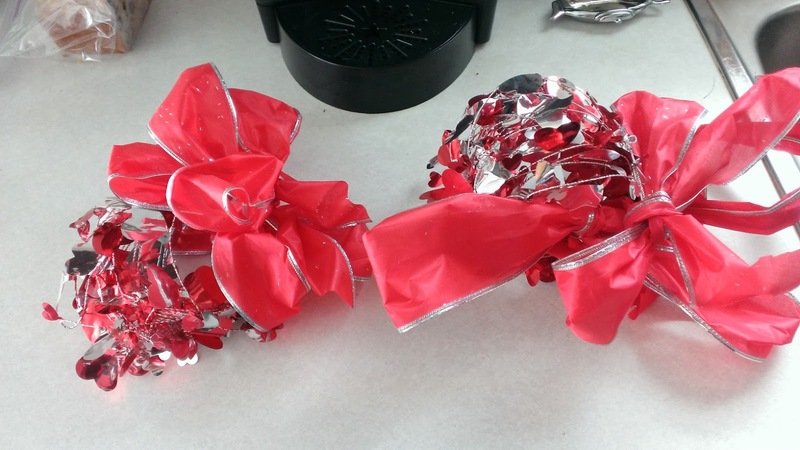 Once the shiny rope is secure you can start making bows..Make numerous simple bows on top of each other. 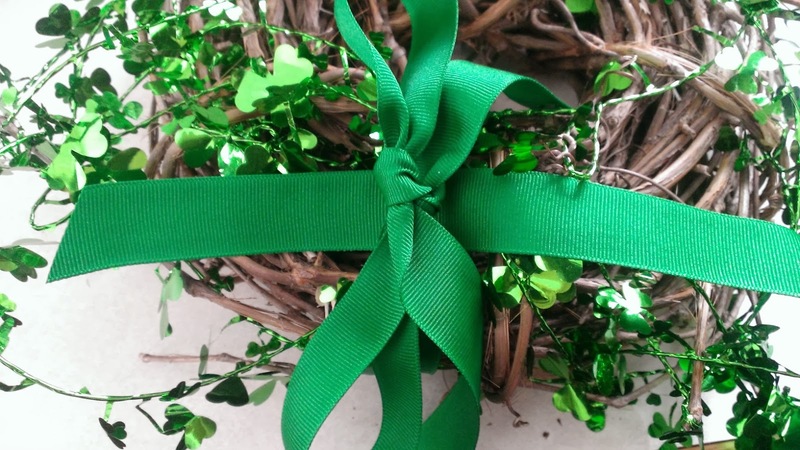 I like this type of bow for wreaths - makes them look full and unique. Simple holiday wreaths. I save my ropes and ribbon from year to year. This year while shopping at the Dollar store Isa found the garland and new green ribbon that she wanted to use. The foil shamrocks are from last year. 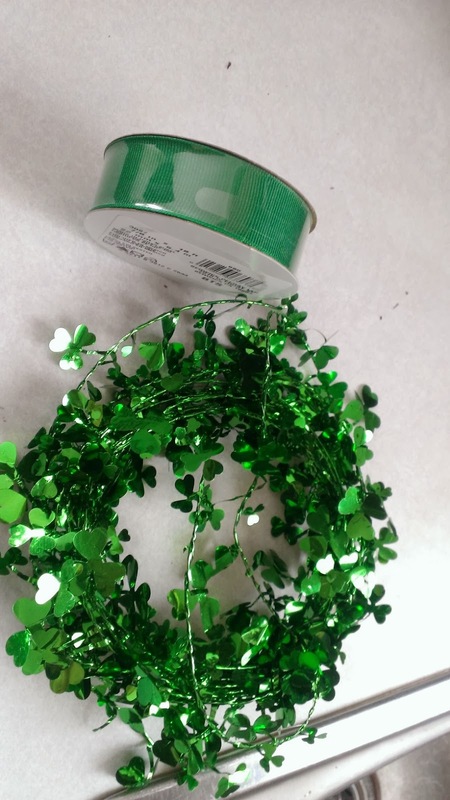 Shamrock Wreaths for 2014 cost $3.00 for two wreaths - 2 rolls of Green Ribbon and I roll of Green Garland (Green shamrock foil rope was from last year's wreath) purchased from the Dollar Store. While shopping at the Dollar Store yesterday I picked up some shiny Easter items...check back on the March 19th ~ I will be making and posting pics of my Easter Wreaths. These are both very pretty. I like that you are reusing last year's items! Very thrifty!! They both came out awesome. I love putting wreaths on my door for the different holidays, too! What a pretty and simple idea! I love wreaths for different occasions! Those look really great. Neat ideas for decorating! These are all very wonderful but my favorite is the shiny shamrocks! These look beautiful! What a fun craft! These turned out great! They look so easy to make too! I'm all for easy & inexpensive. These are some cute wreaths you made. You are so talented. These are so pretty. I have been admiring these for days!! They are so darn cute!!! You make this look easy and fun. Thanks for sharing! You know, I have never made a wreath because they always look so hard. I see people making these masterpieces that I have been afraid to try. THanks for making it look so easy! Great wreath ideas! I love dollar store DIYs!! I love to make my own wreaths for holidays and seasons. We have one that we collected seashells for that hangs up every summer. I really like your Valentine's wreath. Such cute wreaths. I love when something is so cute and so simple. This is beautiful! You've inspired me to make one for Saint Patrick's day! Great job! Those are both very pretty! Those wreaths look very pretty. I'd love to try to make my own sometime. Nice that you can use the same materials for different holidays! That would be awesome for my small space. 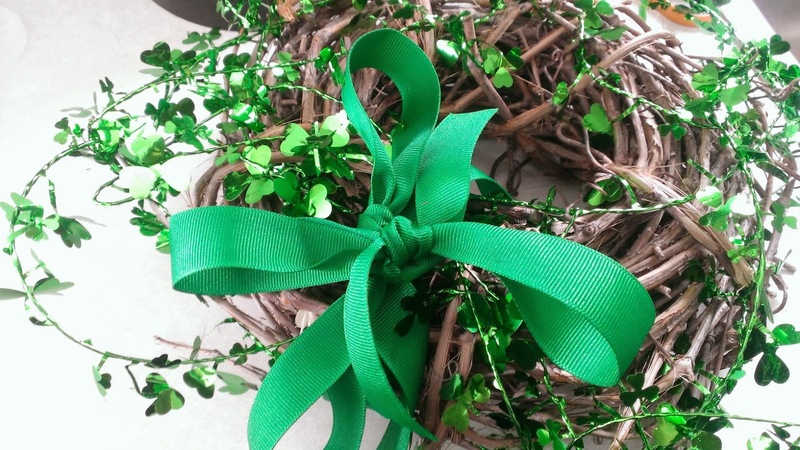 I never thought about getting a vine wreath - but I really love that look! I love the idea of being able to just redecorate it for each holiday rather than having to buy a whole new one! The dollar store is a great place for supplies to help make projects like this! I'll have to get back in there and get some things! 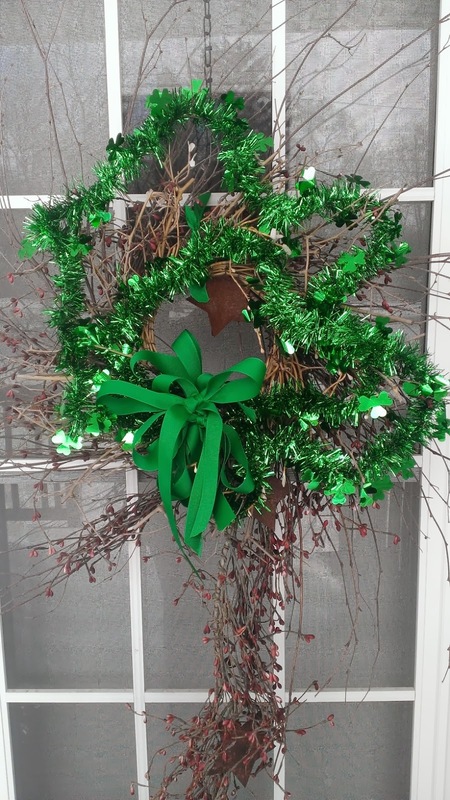 I love the St.Patrick's day wreath! This is such a great idea! I have never made a wreath and only have seen them during the Winter holidays. I've never seen them green. This is really nice! It is a great idea to have a thing like this you can use for all holidays. Such a practical idea. I don't have a crafty bone in my body, but this looks simple enough for me to do. I love the shamrock one, perfect for the upcoming St. Patricks day!! My mom enjoys making her own wreaths as well. We have a ton of them in the garage for every holiday. 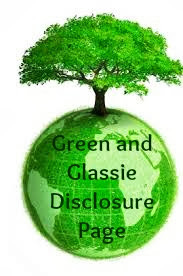 I love the green! Perfect for St Patty's day. Those are really pretty and simple ways to decorate for the holidays. Thanks for sharing! 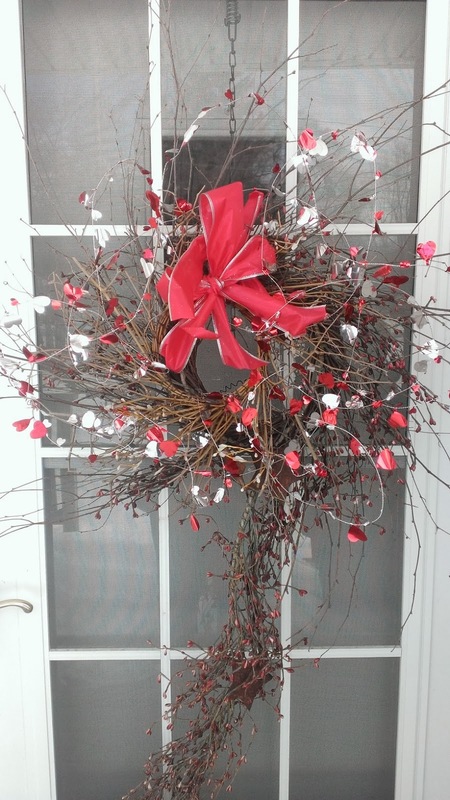 Wreaths are such a popular way to decorate for any holiday. I want to start making my own too, as they don't seem that difficult to put together. Those are so pretty, I LOVE the Valentine's Day wreath - beautiful! You make it look so easy too! Those did turn out great. Wreaths add a nice 'this home is loved' feel, I think. I like to see a pretty one when I'm walking up to a house. I don't have one St Paddys day decoration so I am happy to see this post. I had given all my decorations to my Granddaughter and now need to get busy. I love that you have enough to make two. My neighbor would love it! I like that you are recycling materials! Wreaths are a great and easy way to decorate. I always have one on our front door to match the holiday/season. I love making wreaths but haven't done a single one yet this year. Thanks for the great ideas! These are so cute! You are the house I would always be so jealous of! I love these! They turned out really good! I might have to make some of these, they kids would love it I am sure! What cute wreaths! Even I could do these! I love hanging wreaths for the holidays. These are very pretty and gives me ideas for my front door! I love different wreaths for the different holidays. I made one for Halloween years ago that I still hang up. I love your idea with the vines. Love it! Such a nice wreath! You make it look so easy to make. I am defnitely going to try this one. My daughter loves to do DIY projects! These are really cute!! I love grapevine wreaths too. They're so easy to redecorate for each season like you've done. I love that green garland! Love this, what a brilliant idea. 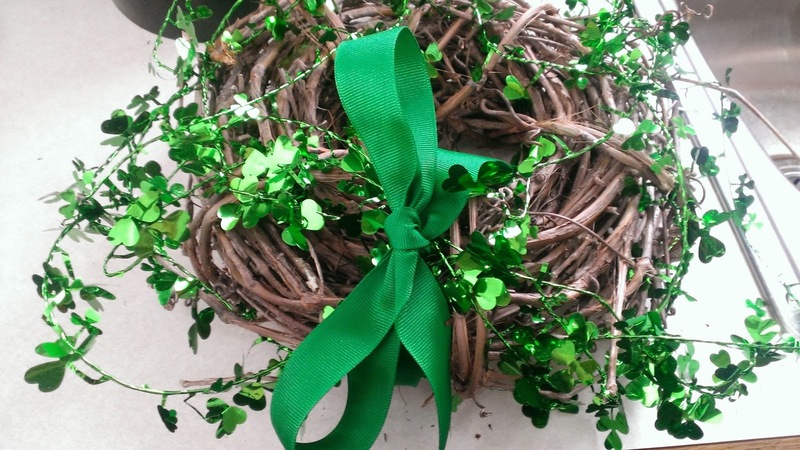 We really should decorate for St Patty's Day and Spring to get the feeling of Spring is coming around the home. Suffering from cabin fever badly! This is a great idea! Now I need to go find a wreath! It's beautiful and economical I love it! I am a simple girl and this is a great way to acknowledge a holiday without going overboard! These are so cute! I love starting with the natural base - it looks great! I love hanging up wreaths for each month of the year! I still have a pink and red heart one up. Time to try one of these ideas! What a cute little mardi gras wreath. I keep forgetting that wreaths can be used year round. I like repurposing things for an updated look. These wreaths are really beautiful! And I love the idea of reusing them for all the holidays. Very trifty and frugal! I'm a fan of wreaths because they add a beautiful note to any front door. Thees are quite lovely. Your wreaths are beautiful! That back door one is so stunning.